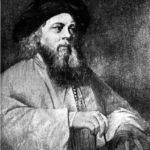 Israel ben Eliezer known as the Baal Shem Tov or Besht, was a Jewish mystical rabbi considered the founder of Hasidic Judaism. “Besht” is the acronym for Baal Shem Tov”, meaning “Master of the Good Name” or “one with a good reputation”. The little biographical information about Besht comes from oral traditions handed down by his students (Jacob Joseph of Polonne and others) and the legendary tales about his life and behavior collected in Shivḥei ha-Besht. "The world is new to us every morning – this is God’s gift; and every man should believe he is reborn each day."